You’ll head out over the Sydney Harbour Bridge. Its arch based design has led to the Bridge being known to locals as ‘the Coathanger’. Designed in 1924 to connect the northern and southern shores of this growing city, the Harbour Bridge opened in 1932 and is one of the city’s most well-known and photographed icons. From Milsons Point you’ll get a fantastic view of the iconic Sydney Opera House. This World Heritage listed building designed by Jørn Utzon is considered a masterpiece of late modern architecture and a world class performing arts venue. To the Australian community, it is very simply a national treasure. Make sure you have your camera ready, as views of the Opera House don’t get any better than this! Now you’re going to see something really special! Arabanoo Lookout offers views out to North and South Head and over the incredible Pacific Ocean. It’s just breathtaking, particularly if the whales drop by for a visit. The lookout is named in honour of Arabanoo, the first Aboriginal man to make his home among European settlers. SEA LIFE Sydney Aquarium houses the world’s largest collection of all-Australian aquatic life, and takes you on a journey through 14 newly-themed areas including Tropical Bay of Rays, Discovery Rockpool, Mangrove Swamps, South Coast Shipwreck, a new ocean tunnel walk-through, Shark Valley and Shark Walk, where you can face your fear, walking over huge sharks! Along the way you’ll also encounter some of the world’s most incredible animals, including two of only five dugongs on display anywhere in the world, massive stingrays, majestic turtles, jellyfish, platypuses, penguins, thousands of tropical fish and much, much more. Journey around Australia on an all-Aussie animal adventure at WILD LIFE Sydney Zoo. Get up close to koalas, walk amongst kangaroos and wallabies and come eye-to-eye with Rex - one of the world’s biggest crocodiles! With a host of other unique and legendary animals, including the wombat, cassowary and many more, WILD LIFE Sydney is the Australian animal adventure, all conveniently located in the heart of Sydney city’s beautiful Darling Harbour. 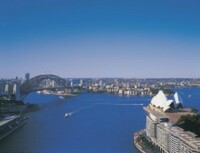 You will have the afternoon at leisure to explore Wildlife World and the Sydney Aquarium. Stay as long as you please and make own way back to your hotel.